Trying to get Smart Things Hub friendly wall light switches. I have couple of Phillips Hue bulbs, and what I like about em they fade in/out on on and off, usually takes a second to do this. How can I achieve the same thing with a light switch, controlling regular fade-able LED lamps? I don’t want dimmer switch, though. I do not know of a wall switch (smart or otherwise) that will do what you want. There may be bulbs that could be programmed to do so - but not a switch. One suggestion - Replace the LED with a smart LED with transition capability. Then procure a smart “button” that when pressed turns the light on with a transition. Yeah, the issue here is that you don’t want a dimmer switch. Non dimmer switches typically use relays to control the on/off which can’t do transitions, while dimmer ones use other circuitry that allows the transition effects. Why don’t you want to use a dimmer? The GE Z-wave dimmers look identical to on/off switches, and as long as you don’t long-press it won’t actually do any dimming. It will, however, do the nice fade on/off that you’re looking for. I have mine set to go to 100% on double tap up so it’s easy if someone happens to change the dimming levels to where I don’t want. As @lzrun Said, a regular on/off switch is typically just that: a mechanical relay that goes on or off. No dimming effects with those. What you were asking about is called “ramp rate” And is available as a configurable parameter on many different brands of smart dimmer switches. Because they are digital dimmers, these switches typically look identical to the binary on/off switch except for an optional dimmer bar on the side if that’s the concern. Thanks, seems like that last Leviton is what I need. What I meant by not having a dimmer was actually I am not going to dim, and I don’t want to have something that looks like a dimmer. But this hidden dimmer is what I need. 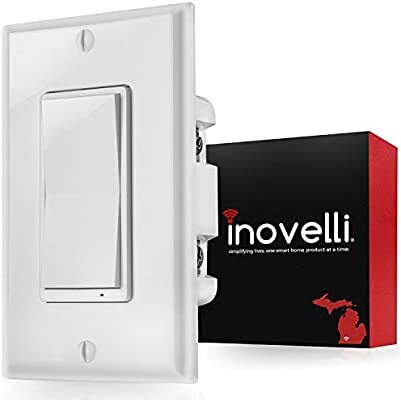 The switches from Inovelli (easily found on Amazon) will do the same thing for you, as well as control scenes if you’d like. With scene control, a different number of taps (2x, 3x, etc) in the up or down direction will activate whatever scenes you set. They are available in decora style and toggle style and they are also only about $30 compared to many of the other larger brands at $40+. Worth a look, I’d say. I may be mistaken, but there’s nothing in the manual for the Inovelli dimmer or switch that says ramp rate is configurable. In smartthings, a scene is a single moment in time with the a single level for each included light. It doesn’t have fade down or ramp up features. By default, the switches have a fast ramp up/down, but with the device handler above, you can customize ramp rate amongst other features. Also wondering, that “ramp rate” will be the same weather you use hardware button itself or thru the app? Or how does it work? Also, in one of the smart homes (I think it was control4) I’ve seen multi switch like this, what is that? Can I use it with smart things? You can’t use that particular device with SmartThings, but that’s a scene controller and there are ones which do work with SmartThings. It’s up to the manufacturer, so it varies somewhat from model to model, but typically it’s a setting stored in the switch itself and it will apply no matter how you activate the switch. Hey everyone, sorry – didn’t see this until now – we’re working on some pretty cool firmware on these switches and I was testing/geeking out over it all day today. Yeah, I’m re-writing the manual to better explain it, but basically you can change the ramp rate via our device handler or via parameters on other HUB’s (device handler is much easier). The ramp rate will allow the switch to, “ramp up” to turn on faster. Right now the default is about 1-1.5 seconds for the light to fully dim on. In order for it to come on quicker, you simply enter a value in the settings/menu to change the speed. The higher the number, the fast it turns on – you can make it instant too. We’re working on a way to make the ramp rates independent of one another (ie: ramp up and ramp down) but I don’t think that will be released this next batch. Great question – yes, it will be the same regardless of local/manual use or via the app. Have the lights come onto a certain level maximum at certain times of the day (ex: let’s say late at night you don’t want to wake anyone up with that blinding bathroom dimmer light – so you set the switch to only turn on a maximum of 10% from the hours of 10pm to 6am, whereas during the day you want it to turn on a maximum of 75%). This is via manual control too, which is pretty cool (ie: when you actually tap the switch it will only go to the max percentage you set it to go). More to come, but thanks for the ideas – we’re always trying to improve and look to you all for suggestions. You are talking about this one? You got it! Yes, that switch has all of the above as well as the Z-Wave Central Scene feature (ie: double/triple tap to activate a scene). Ok, I have started shopping. I was about to order GE dimmer switch, GE Z-Wave Plus In-Wall 500S Smart Dimmer. However reviews are saying there is a second delay between light acrually goes on when you press the switch, and also there is a distinct relay click sounds. That doesn’t sound like fun. So is there kind of in depth review of the z wave light dimmers with details like that? Typically reviews just saying if it is hard to install, need neutral etc, but nothing about the ramp rate, switching delays, clicking sound. Which Ge dimmer and how did you get double tap to 100%? Are any of those cool firmware features available? Hey all - yes, all Firmware above is included on our switches. These advanced features will only work with a device handler installed. To my knowledge, handlers will only work using the Classic App at this time. The scene switches are currently sold out on Amazon (and the normal ones are dwindling fast) but we do have some at HQ until we’re able to replenish. Feel free to reach out to us if you would like some (contact@inovelli.com) or PM me, I can help. Have an awesome night and I’m happy you answer any more questions! I am trying the Inovelli NZW31, no luck so far. I have installed the dimmer NZW31 in a single switch configuration to control 9 ceiling can LED lights. I did pair it with the smartthings hub, however it doesnt turn on the light neither manually nor thru the app. Blue LED light ocasionally turns on/off, not sure if it is normal. I did refresh the z-wave mesh, try excluding and pairing it back, removed the airgap - same thing. Also, orignally installing I switched hot/line, hope it did not toast the switch.